I am an eleven (11) year customer. My European FAX number has been out of service since Monday April 5th until today it appears to started working again. No notification from eFax customer service. J2 Global's eFAX Dublin Customer Service folks haven't taken my problem very seriously. One time I requested to speak with a manager and they refused. I asked for a return call which they said they would make by 5 PM but never happened! At first I contacted the host provider of the number CSC Telecom in Latvia; but, they did not even know it was a number associated with their company and said it was an Estonian responsibility. 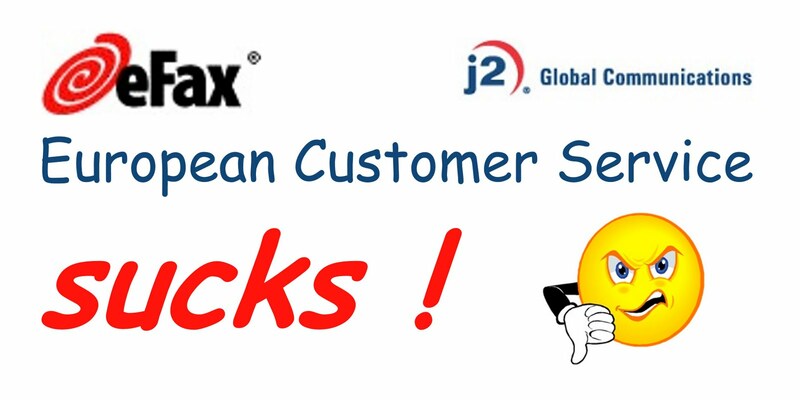 After opening the ticket with eFAX Customer service by telephone, J2 & eFax's management appear not to be interested in escalating the problem and achieving customer satisfaction. In addition to contacting the Dublin service center by telephone, which has proved worthless, I have sent emails to three (3) different eFAX customer service addresses and on 14 April, I left a voice mail message on Tim McLean's (VP International) vmail box. He did not even offer the courtesy of having a secretary return the call ! In order to operate my business, I was forced to find another solution for my FAX needs in Europe so I no longer need this eFAX number.